The nation’s state and territorial foresters met in Whitefish, Montana, last week for the 2018 National Association of State Foresters Annual Meeting. Their discussions focused on state Forest Action Plans, federal and state partnerships, and the many societal benefits of healthy forests and trees. The meeting brought state foresters together with their federal partners at the Agriculture Department and the Forest Service, as well as forest industry stakeholders. A long list of national leaders from land management agencies and partnering organizations spoke during the meeting’s packed agenda, and more than a dozen exhibitors and sponsors supported the conference. State foresters were joined by Montana Governor Steve Bullock and Montana Department of Natural Resources and Conservation Director John Tubbs at Monday’s Presidents Reception where both emphasized the importance of active forest management. Monday and Tuesday’s programs featured roundtable discussions on many of the leading issues facing state foresters. 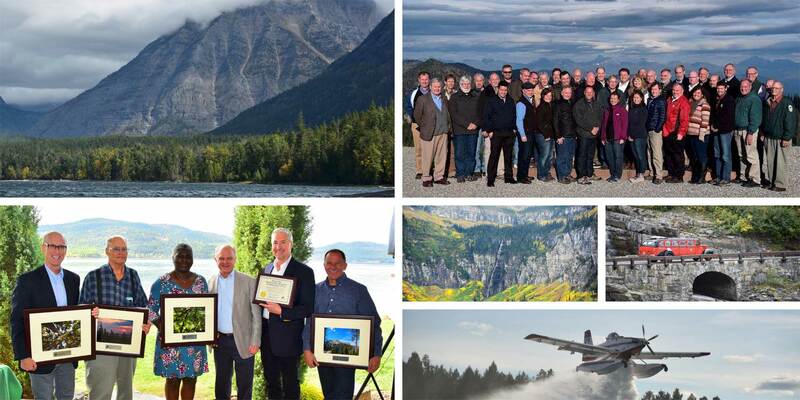 NASF members elected a new executive committee, adopted two new positions in support of emerging wood markets and coordinated wildfire management, and honored several individuals for their extraordinary contributions to state and private forestry. On Wednesday, more than 200 attendees enjoyed four general sessions on topics ranging from Good Neighbor Authority to a communications campaign on the power of healthy trees. Newly confirmed U.S. Agriculture Department Undersecretary Jim Hubbard also spoke on the bright future for coordinated state-federal forest management. On Thursday, state foresters enjoyed a technical tour of the Whitefish Trail System and Glacier National Park. The park’s superintendent, Jeff Mow, explained to those on the tour how wildfires have affected the Montana landscape. Did you attend the 2018 NASF Annual Meeting? Please consider sharing your experience with NASF’s staff and joining us next year for the 2019 Annual Meeting in Asheville, North Carolina. In the meantime, stay up-to-date with state foresters at www.stateforesters.org and through NASF’s social media channels @stateforesters. Kiersten Ahrns is NASF’s 2018 Fall James Hubbard Intern for Policy and Communications. She can be reached by email at intern@stateforesters.org.